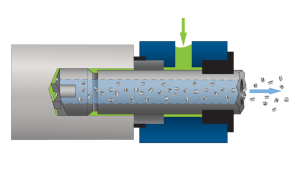 BTA drilling is a deep hole drilling process that uses a specialized drilling tool on a long drill tube to produce deep holes in metal, from holes with a diameter of 20 mm [0.80 in] and larger, up to depth-to-diameter ratios of 400:1. BTA drilling is the most effective method of drilling deep holes, as it is a cleaner, more reliable and capable process than conventional twist drills, and can achieve larger diameters and higher feed rates than the alternative gundrilling. BTA drilling tool heads are threaded or mounted onto long drill tubes, and use multiple cutting surfaces on a single tool to remove chips efficiently, exhausting them using high-pressure coolant through holes in the tool head, then out the drill tube and through the machining spindle. 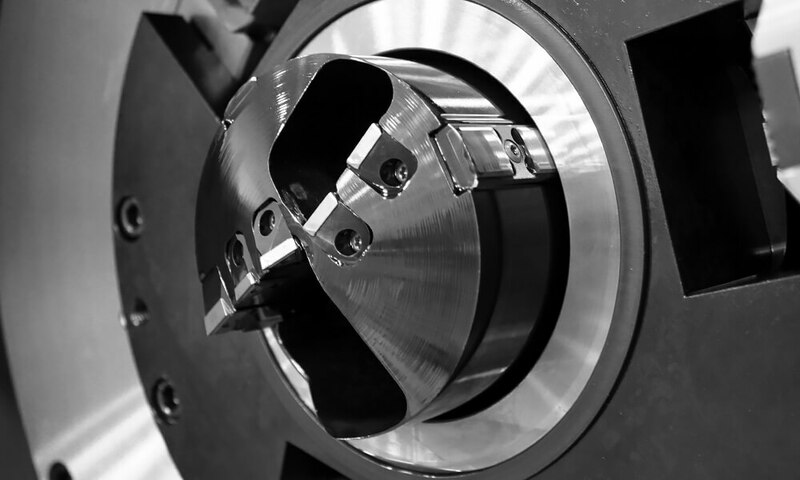 BTA tooling is available in brazed or inserted carbide configurations. BTA stands for Boring and Trepanning Association, and is also sometimes referred to as STS (single tube system) drilling, as it uses one single drill tube for the BTA tool, compared to other processes such as ejector drilling, which use two. BTA drilling can achieve drill feed rates of typically 5-7 times faster than gundrilling at the same diameter, due to the tool design, more efficient chip exhaust, and machine design and power. BTA drilling machines introduce coolant around the tool head, and evacuate chips through the drill and machine spindle, compared to gundrilling, where coolant is introduced internally and chips exit through an external groove. BTA drilling is effective in holes from 20 – 200 mm [0.80 – 8.00 in], a greater size range than gundrilling. BTA deep hole drilling is the ideal process for a range of larger deep hole drilled depths and diameters. BTA drilling, and secondary processes, are capable of drilling extreme depth-to-diameter ratio holes while achieving strict tolerances. Deep hole drilling machines that are designed to perform BTA and related processes are complex systems of high-precision components, designed and built for extremely deep holes and strict tolerances. View a machine diagram to learn about BTA drilling machines. BTA drilling tools are chosen and integrated into the deep hole drilling system to achieve the highest tolerance standards possible.